Formed under the Monicker of "Oesophagus" in 1993. Doom/Death metal band had Vocals: Bernd Golderer, Guitars: Marcus Rembold, Guitars: Udo Plieninger, Bass: Alexander Woydich, Drums: Alexander Dallinger, Keyboards: Marco Schilling. In 1999 three members of the group went on to form "No Love Lost"
Pro printed covers. No lyrics. 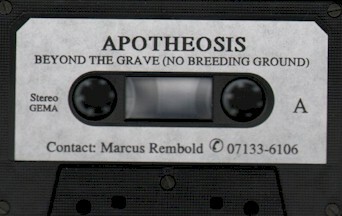 Tapes have stickers on the shell.